Walking into Madsen is like walking into an Ikea display room, complete with birch veneer chairs and tables and half empty bookshelves. It’s minimalist (slightly clinical and sterile) and is, rather unsurprisingly, Scandinavian. I can’t remember visiting a restaurant in London on a Thursday night that was as empty as this. 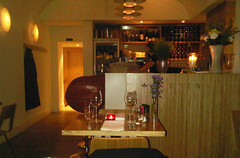 We arrived towards 8pm on Thursday evening and there were two other tables of two already dining. Once they left, we had the restaurant to ourselves and shortly after 10pm we seemed to have outstayed our welcome, judging by the signs of cleaning materials. That said, there is an interesting and unusual dinner menu with many fish and healthy vegetable and salad options. For starters we had mustard and honey marinated herring served with dill potatoes and garnish @ £6.95 and gravlax (dill cured salmon on toast with classic mustard sauce and mixed leaves) @ £7.50, both of which were beautifully prepared and very tasty. For mains, we chose slow-cooked shoulder of pork on a bed of oven baked Jerusalem artichokes, tomatoes and mushrooms @ £14.50 and fried filet of brill on a warm salad of Brussels sprouts, lemon and parsley and a green herb oil @ £16.95. 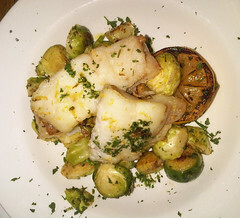 The green herb oil was absolutely delicious but the fish was slightly overcooked and dry, while the Brussels sprouts had barely blinked at a stove. This meant they retained their flavour and were lovely and crunchy and quite raw. I like raw vegetables (and confess to enjoying raw cauliflower dipped in thousand-island dressing, Pizza Hut salad-bar style. Ok, that’s the only time Pizza Hut will be mentioned on this blog) but if you don’t, then don’t expect to enjoy the sprouts at Madsen. The side dishes of potatoes and root vegetables (sauteed, slightly caramelised potatoes, carrots and parsnips) were really good. All this was accompanied by a house white wine (a dry and very drinkable Spanish El Muro Blanco 2008) very reasonably priced @ £17.25. There aren’t many Scandinavian restaurants in London so Madsen does have a bit of a novelty factor. 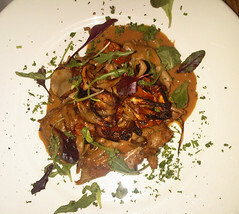 It’s nice to try if you like to experiment when dining out, but probably not one to re-visit.